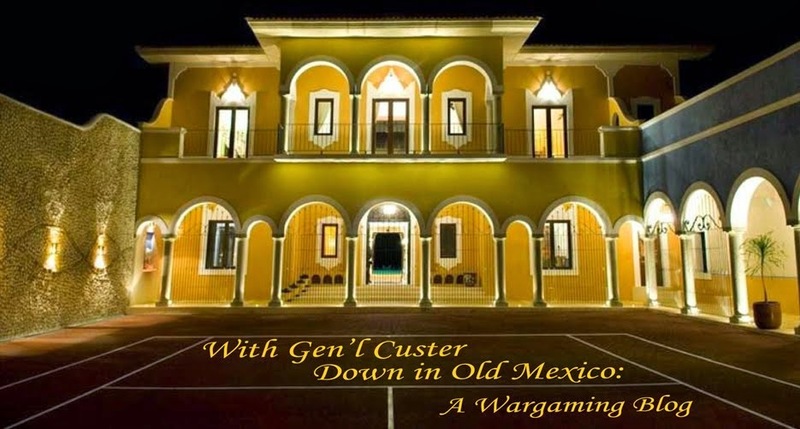 With Gen'l Custer Down in Old Mexico: A Wargaming Blog: Tis the season . . .
. . . for the annual Analogue Hobbies Painting Challenge. Every year, this inspires me to dust off some space, pull the paints and minis out of the boxes they're in, and try to make some kind of progress. This year is no different. I've set the very modest goal of 200 points, which I achieved in the 4th Challenge, and failed miserably in the 5th. Dire threats have been made about feet and fire here for the VI Challenge. It being Romanesque theme of 'game changers', the use of Latin numerals seemed appropriate. Given holiday plans and other commitments, I probably won't make the 3rd. My preliminary plan is to paint and submit a 1/2400 HMS Dreadnought for either the nautical or risk taker themes, she being the most famous nautical game changer out there. Since the Curtgeld this round is a 25/28mm Gambler/Risk-Taker, that's an automatic Bonus Theme submission. I have always been fond of the Lace Wars. We originally played using Habitants and Highlanders, which is a Canadian Wargamers Group ruleset for the Seven Years War in America. Despite that, it's proved to be readily adaptable to the more cavalry-heavy battlefields of Europe. The only real need was new morale ratings. We originally began with somebody's French and Allied collections, and then I acquired a sizable collection of Old Glory 15mm Russians and Prussians. If you like the SYW and don't have this, go buy the PDF. Shoo, off with you now! The book contains a history of the war in North America, a campaign generator, skirmish and big battle rules. What I especially like about them are how you have an uncertain time factor driven by customizable action decks, and how they're readily amenable to upscaling. Other rulesets followed. We played a lot of Age of Honor's Fire and Fury, focusing on the War of Austrian Succession in Italy, with Austrians, French, Spanish, Neopolitans, and all that jazz. Since I didn't really have figures for the period, mine sat in a box. I slowly began expanding the Prussians, painting lots of cuirassier, since I desperately needed cavalry for the Prussian contingent. Köingkrieg followed. I became heavily involved in both the rules-testing and the development of Russian orders of battle. My figures cane out of the box, and more were purchased or added. Trolling through orders of battle at the Seven Years War Project, I settled on Paltzig/Kay and began expanding. A typical Russian deployment - infantry out front, less than stellar cavalry in reserve. We're a whole cavalry regiment, really? Unfortunately, things never were quite right. All these rule sets use large figure ratios. Habitants and Highlanders and Königkrieg are all 1/50, while Age of Honor is 1/90ish (4 infantry figures per stand, one stand representing 360 men, 2 cavalry per stand, representing 180 men). None really give the right visual scope for infantry, since battalions are twelve figures, max. Cavalry regiments are similarly small. The scales precluded fielding cavalry by squadron, since the units would be 4 or less. With cavalry regiments, you don't really get the same feel you do with squadrons, where it's a nail-biting, feed 'em in and pray. You also find the smaller regiments (like a French or British one of 2 squadrons) heavily overpowered by a five squadron Prussian one, despite the greater ease of handling six vice ten or fifteen squadrons! 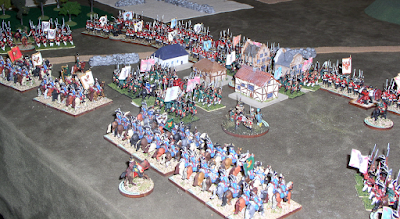 I'd played several 28mm games, where larger (30 man) units were used, and the felt much better. The League of Augsburg, Jim Purky, and especially James Roach have spectacular displays. Though, being 28mm, battles were much smaller in scope. Budget, time, and having lots of 15mms already, investing in 28mm figures at 30+per battalion just isn't feasible. Wanting the best of both worlds, I've decided to return to Habitants and Highlanders, since it is my favorite rule set, and expand my 15mms again. While designed for 1/50, the rule mechanics will work just as well with more figures per unit. The fire factors and morale rules scale with unit size anyway, and it's designed to take up to 24 figures per unit, perhaps even more. James Roach's set up for Mollwitz, the kind of scope I want. So, for the challenge, my main focus is expanding my Seven years War collection. Fortunately, lots of 15mms were glued to popsicle sticks, primed, and then set aside to await painting, so not much prep work is needed. More troops are coming, boys! He might even fix our gaiters! Editorial comment: I stuck my challenge plans post into the "draft" folder to switch computers, since the photos I wanted to use were not on my main desktop. Since then, my challenge plans have been overcome by events. I was offered and accepted a job on the other side of the North American continent, with a move right smack dab in the middle of the Challenge. Needless to say, I have had to seriously rethink how to do this, and whether I will have the time to get paints out of storage, paint, then repack to load on a truck the start of February. Instead, I may just be a mad, mad painter the last month. 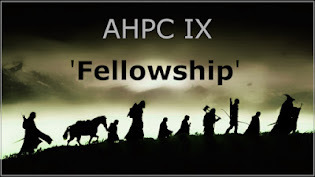 I used to use H&H for my 15mm FIW, they were a great set of rules. I may have to dig them out again! Good luck in the Challenge and the move!!! You should. They are a great set of rules and their action system is probably one of the first, and best, variable-time factors to create opportunities or to show folks who couldn't exploit them. 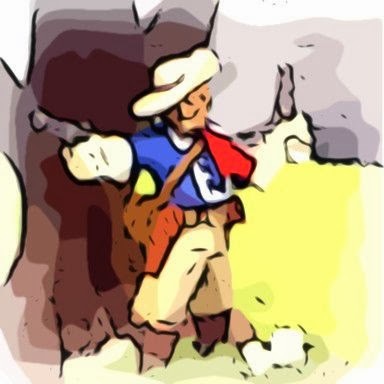 I'm (naturally) thinking up a lot more tweaks to them to incorporate my understanding of how Seven Years War infantry fought, but it's great as is. What I usually do for the Prussians is put better quality leaders into play, but I could also just allow the Prussians to have one quality better action decks for each level. I was scouting out nice painting tables to put in the truck, so I can get started painting as soon as my stuff gets there. So, while I'm being sent out for ice, I'll make the party!